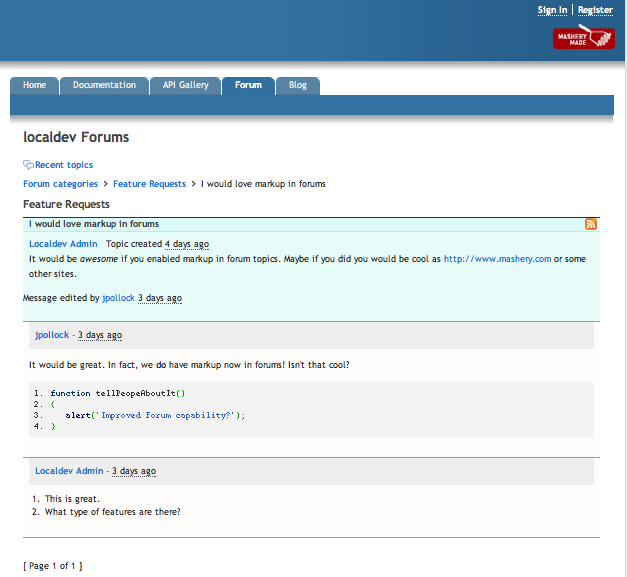 Today's developer portals often leverage a well-known web feature: discussion forums. Useful for self-service support, knowledge sharing and general discussion, forums are a great way to connect developers with your API program and to each other. These collaboration areas are one of the ways to forumalate a two-way discussion between you and your community. Not only can you talk to your developers but they get to express themselves, whether asking questions about API usage or collaborating with others on problems or ideas. And when they do participate, developers want the ability to do so beyond what simple text input areas on a form provide. Whether to emphasize a point, link to other developer portal or external resources or help others through code examples, developers want more and better ways to communicate and collaborate. In discussion forums, one way to do this is to enable developers to add HTML-style formatting, hrefs for links to other resources and, when providing code examples, see code highlighted in a similar way to how they would in their favorite IDE. Ability to use Markdown for formatting of posts and comments. Ability to drop in sample code and have it highlighted, using language-specific convention and styles. Ability to have links generated automatically, simply by typing in the URL, e.g. http://www.mashery.com , rather than the full Markdown syntax. Faster performance due to enhanced caching and architecture. 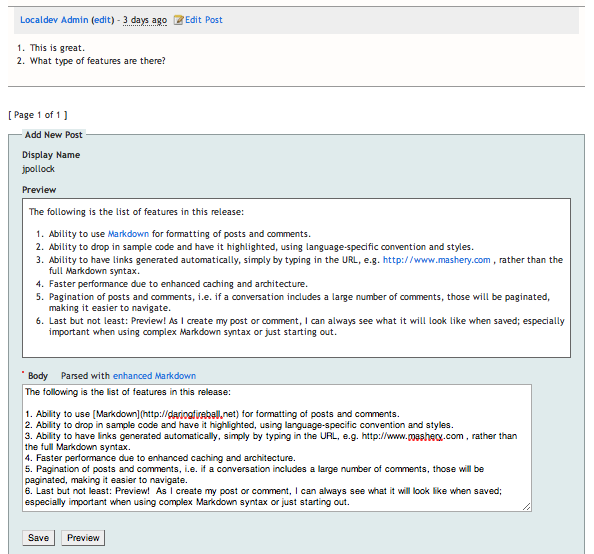 Pagination of posts and comments, i.e. if a conversation includes a large number of comments, those will be paginated, making it easier to navigate. Last but not least: Preview! As people create their posts or comments, they can always see what it will look like when saved; especially important when using complex Markdown syntax or just starting out. A couple of demonstration screenshots can be seen below. We hope that you'll find these enhancements useful. Do not hestitate to provide feedback or contribute other ideas on how Mashery can make discussion forums even better!